In 1925, William and Charlotte Wiser arrived in the North Indian village of Karimpur. Over the next five years they wrote one of the first studies of village India, originally published in 1930. Charlotte Wiser continued to observe and write about the village until her death, when Susan Wadley picked up the narrative. With updates from the 1960s, 1970s, 1984, and 2000, this expanded edition now encapsulates seventy-five years of continuity and change in the village. 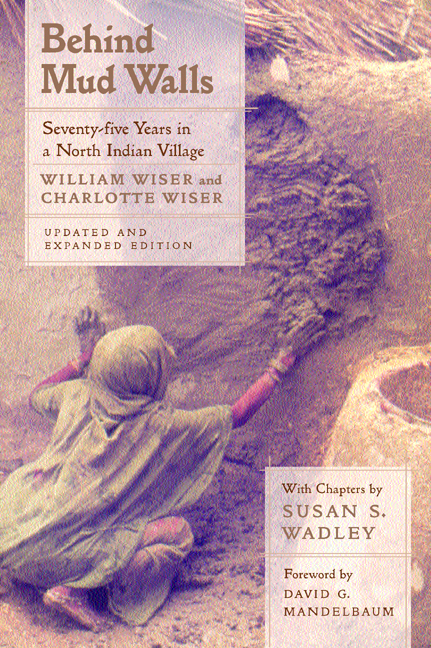 The book traces the initial awkwardness between the Wisers and the villagers and the years of friendship and welcome that followed; sketches the social and economic changes brought on by the increasing encroachment of the outside world; and describes the day-to-day life of people who live in the village—the education of the young, life in the courtyard, castes, marriage, and family. The book now stands as a personal and insightful story of the village and the people who came to study it. William and Charlotte Wiser set up Indian Village Service, a community oriented village development organization that became one of the key models used by the Indian government for its Block Development Programs. Susan S. Wadley is Ford Maxwell Professor of south Asian Studies and Professor of Anthropology at Syracuse University. She is the author of Struggling with Destiny in Karimpur, 1925-1984 (California 1994). David G. Mandelbaum is author of Society in India (California, 1990).